In a blog post this past Winter, we talked about the capacities that a Waldorf Education offers students. We want to talk today about the skills that a Green Meadow Waldorf School education imparts to students. Let’s start from a theoretical perspective and hear from Jamie York, author and Waldorf math educator. In this post, he talks about the skills and competencies that make Waldorf graduates ready for math and beyond as they move into the world. He references an article by Pat Bassett of NAIS, who lays out how students can demonstrate the skills they are learning through performance-based assessment, used at Green Meadow and many other Waldorf schools. Grant Lichtman is also relevant to this conversation, as an expert on the attributes of schools that are successful in teaching 21st century skills. Watch this video through to the end (15 well-spent minutes). At about minute 13.5, Lichtman shares three principles for schools: Teach into the Unknown, Develop Self-Evolving Learners, and Be a Self-Evolving Organization. These three principles align perfectly with Green Meadow Waldorf School's mission, and it's exciting to see alignment between mainstream thinking and the wisdom of Waldorf. Mathematical and scientific skills: Students learn cartography and surveying skills; they understand and practice the scientific method, including formulating and testing hypotheses; they study Anatomy and Physiology from a theoretical standpoint and from a practical perspective through drawing and modeling; they participate in lab experiments in Physics, Chemistry, and Biology; and they learn Algebra and Geometry and can go on to Trigonometry and Calculus. Critical thinking and public speaking skills: Students compare and contrast multiple viewpoints; can write a persuasive argument and a research paper; give a Senior Speech, present a Senior Project, and write a “Song of Myself” as part of their 12th grade self-exploration; compose poetry; understand and discuss the works of authors as erudite and diverse as Geoffrey Chaucer, Wolfram von Eschenbach, William Shakespeare, Zora Neale Hurston, and Langston Hughes, among scores of others. Linguistic skills: Students graduate at an intermediate level or higher in a second language, able to converse, read a newspaper, and watch a film in that language. About 70 percent of our students have completed a 3- to 5-month international exchange program by the time they graduate from high school. Musical skills: Students play an instrument from 3rd-12th grades; perform in bi-annual concerts and at least annual recitals; and participate in Band, Orchestra, and/or Chorus. Manual and practical skills: Students learn to camp, canoe and/or kayak, use many tools, measure accurately, serve those in need, identify plants and animals, build a fire, hike a mountain, garden, sew, knit, paint, draw, bind a book in leather, and make beautiful and useful objects out of wood, clay, and copper. 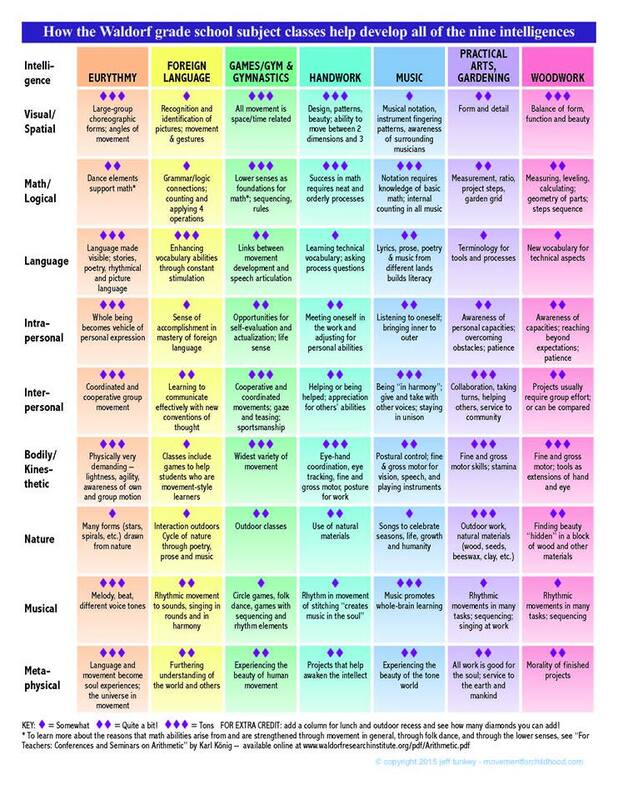 The graphics below illustrate the nine intelligences and the ways that Waldorf Education supports these disparate and necessary capacities and the skills that help them come to life. To learn more, visit the sections of our school: Preschool, Lower School, Middle School, and High School; come to an Introductory Session; or take a look at our school videos. Week 1 : What are capacities? Over the next few weeks, we will be writing about one of the key differences between Waldorf Education and mainstream educational approaches: a focus on the development of capacities. The Waldorf curriculum and pedagogy (what we teach and how we teach) build capacities, first and foremost. We do this alongside skill-building, which we will also talk more about in upcoming blog posts. What are capacities? How are they different from skills? One way to think about it is that capacities are related to character, while skills are tools. Capacities are part of who we are, how we approach the world; skills help us navigate specific tasks and solve specific problems. In his book A Whole New Mind: Why Right-Brainers Will Rule the Future, well-known author Daniel Pink talks about capacities. He outlines the "six fundamentally human abilities that are absolute essentials for professional success and personal fulfillment" (according to the book description): in his words, these six abilities are design, story, symphony, empathy, play, and meaning. These are capacities: everyone, in any industry or walk of life, benefits from having developed these characteristics (or approaches, or ways of thinking) and from applying them in any situation they encounter. Whether there are six fundamentally human abilities or more is another question, but the important alignment between Waldorf Education and Pink's premise lies in the identification of broad capacities rather than specific skills at the core of success and happiness. Pink says, "I think Waldorf schools are very much in synch with the notion of Conceptual Age and the ideas of A Whole New Mind. They foster internal motivation in students, as well as mastery and persistence. They teach the habits of the heart that children need to do well in life after school." An example: if we have the capacities of curiosity and tenacity, we are likely to succeed in solving problems, since we will have developed a habit of approaching difficult situations or questions with interest and a willingness to learn their contours, and we will persevere as we develop whatever skills we need in order to arrive at a solution. The cultivation of capacities takes many forms in Waldorf Education. Our students build intellectual capacities (academic approaches and habits of mind) by participating in a developmentally appropriate, interdisciplinary, rigorous curriculum that is nearly 100 years old, always evolving, and absolutely unique in the world. They build social and emotional capacities like patience, empathy, courage, and kindness by moving through their school life (and through their childhood and adolescence) in tightly knit class communities, forming strong bonds with the community of teachers and staff, and challenging themselves by taking advantage of curricular opportunities like performing a class play every year in the Lower School and going on an international exchange of three or more months in High School. They build physical capacities through experiences inside and outside the classroom that push them beyond their comfort zone: walks in the forest from the age of three, wilderness trips, games and sports, knitting and sewing, weekly instrument lessons and regular recitals starting in Fourth Grade, and the movement art of Eurythmy, unique to Waldorf schools. Finally, they build spiritual capacities like wonder, awe, and humility through a experiential education that prioritizes hands-on learning and a phenomenological approach, allowing students to come to their own conclusions through observation and identification with a subject. In our upcoming posts, we'll look at the development of capacities in each section of the school: preschool (Nursery and Kindergarten), Lower School, and High School, and we'll talk more about the skills we help our students build, alongside the capacities described above.